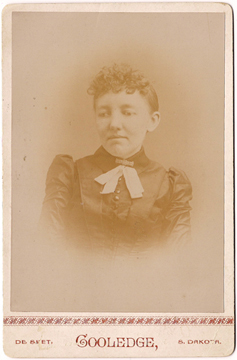 This entry was posted in History and tagged Mary Ingalls by SDHSPress. Bookmark the permalink. Thank you for sharing this. This is fascinating as well as enlightening. I had no idea that the Territory made such a provision for blind children. I look forward to reading Pioneer Girl! Very interesting. I always wondered why she was there for 7 yrs, just seemed like an odd amount of time. Any information on the year she was not at the school? Didn’t she miss a year due to illness? Can’t wait to read the book when it finally comes out!!! I’ve enjoyed reading the little bit that’s been made available here. Do you have a date yet? We are glad you have enjoyed the website, Carla. The book will be available at the end of November, and we are currently accepting pre-orders. What caused Mary’s blindness? There is some confusion in Pioneer Girl. In one place it says her blindness was a result of scarlet fever (pg 55). In another place it says it is from measles (pg 103). Thank you for your question, Lena Rae. In our blog post Mary’s Illness, we address this subject. Wilder used scarlet fever in her fictional story By the Shores of Silver Lake as the cause of Mary’s blindness. In reality the Ingalls family attributed it to the after effect of measles; however, as stated in the annotations (page 103), a more recent study in the journal Pediatrics concluded that this scenario was also unlikely. The speculation now is that Mary blindness was due to viral meningoencephalitis.